Starmark celebrates 10 years of eTips! This month marks the 10th anniversary of Starmark eTips and we couldn’t be more proud and grateful to our in-house experts for their contributions over the last 10 years in helping us keep marketers abreast of the latest trends in branding, advertising, digital and mobile marketing. To date, we have published nearly 300 eTips and five volumes but are they still relevant? Do they stand the test of time? How many of them have gone the way of dinosaur and how many have proven their staying power? 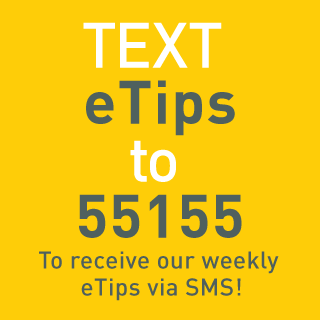 Well, we were just as curious as you probably are and so we bring to you our “Top 10 eTip Countdown! When paying for clicks, businesses tend to focus on the perceived top 10-20 search terms in order to bring consumer traffic to their site. However, if you want to home in on what the potential customer is looking for, then you need to be more specific with your keywords. This is where long-tail keywords come into play. The more precise match to what a potential customer is searching for, the more likely that customer is prepared to make a purchase. All great social applications do one thing right – make it easy to share socially. “Ease of use” is key for all websites and mobile applications especially when you add social media into the mix. First impressions mean everything when it comes to your company’s first expression of your brand identity to the world. Does your company’s logo communicate who you are and what you promise? Much like Maslow’s Hierarchy of Needs, social media has its own hierarchy; five steps to Self Actualization or in terms of social media, Passion and Empowerment–the uppermost tier; and understanding each of the steps leading there will help your brand achieve self actualization in the marketplace. In today’s the media landscape, bad press can travel at light speed in a matter of seconds and unless your business is prepared to combat the proliferation of communication streams, the tide of public opinion could cause near irreparable damage to your brand. 5. Does Google Adsense Make Sense for Your Website? Are you getting enough online traffic to your website or blog to benefit from placing ads on your content pages? From brand consistency and voice to products and CRM, most businesses share nine qualities that are the keys to their success and continuity. If your business isn’t heading in the right direction, read more about how to create exclusivity to nurture your business and thrive in today’s marketplace. While the Facebook Timeline continues to evolve with each passing day, or so it seems, it continues to provide a powerful platform for brands to not only showcase their identity, milestones and news but it serves as the vehicle for instant contact with your customers. Still true today, there is not a more effective method of gaining insights into your customers’ mindsets than with some good ol’-fashioned ‘in real life’ facetime and no better venue than a focus group forum. This is your opportunity to hear it from the horse’s mouth, so to speask, without ambiguity and misinterpreted feedback. In the good old days of print direct response, marketers created dedicated telephone numbers for various pieces of collateral and then tracked their response to determine the most effective distribution channel. A vanity URL applies the same exact principle by driving offline customers online. Still relevant? We believe they are and that’s why they made our all-time Top 10 eTip List.